Each year thousands of rabbits are abandoned at local area shelters. Rabbits are the 3rd most frequently discarded animals at shelters and the most often overlooked. Most are discarded by their owners due to a lack of understanding and knowledge of these highly intelligent creatures. Others are dumped by irresponsible breeders. In the recent past 100% of the rabbits discarded at the Sacramento County Animal Care & Regulation were euthanized. Since its inception, FUR has rescued over 1276 rabbits and decreased the euthanasia rate to less than 1%. 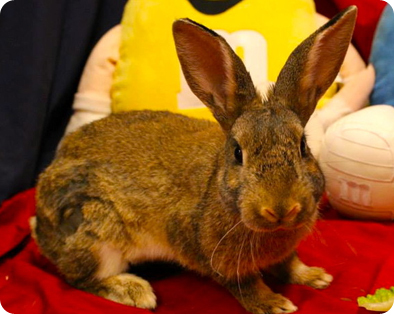 FUR rescues rabbits abandoned at local area shelters. The main shelter we rescue from is the Bradshaw Animal Shelter. Rabbits are spayed/neutered and placed in temporary foster homes where they receive much needed TLC while they recover. All rabbits are litter box trained, and socialized before being housed at Petco Adoption Center, located at 855 East Bidwell Street in Folsom, CA. Some of our rabbits stay in foster homes until they are adopted and are not housed at Petco due to their size and/or special needs. Volunteers care for the rescued rabbits housed at Petco and provide exercise and socialization time outside their cages. The rabbits are adopted to carefully screened indoor homes by FUR volunteers. FUR is run by a group of dedicated volunteers. Friends of Unwanted Rabbits is a nonprofit 501(c)(3) corporation. The Friends of Unwanted Rabbits is dependent upon generous donations from the public. Contributions to FUR are used for spaying/neutering, medical care and fostering expenses. Click here to find out how you can make a donation. Gale Hart is an animal rights advocate and supporter of FUR. Click on her name to visit her website and get information about her upcoming art shows. In October 2006, artist Gale Hart opened a gallery in downtown Sacramento, called A Bitchin’ Space. The goal was to create a more connected, creative community – with A Bitchin’ Space as the outlet. It started with a year-long project featuring collaborative work by area artists. Since the end of the collaborative project, A Bitchin’ Space has hosted monthly shows, including the Circus Show & Other Atrocities. All proceeds benefit rescued rabbits. Ann Ranlett is an award-winning artist & illustrator specializing in pet & animal art and nature illustrations. While you’re browsing the site, please stop by the web store where you’ll find cards, prints and more featuring her work. Ann has painted portraits of Snoopy a rabbit that was rescued by FUR. Snoopy was an older bunny and had severe malocclusion. We had his teeth fixed and he was adopted to a wonderful home. Ann has painted two paintings of Snoopy. There are mugs, t-shirts, magnets and more with Snoopy’s portrait. Ann support’s the FUR program and donates a portion of her card sales to us.s you can purchase everything from hoodies to coffee mugs on our spot at Cafe Press.